This product has 3 versions: United States, Europe, Japan. Products will be shipped to countries or regions where Azure is commercially available. If you need help on version selection, please check the Countries or regions available list for more details. Currently, it is not available for China mainland. This product can only be activated once. Seeed will not accept return once the package has been opened. Check Warranty & Returns here. If there are any quality issues after opening the package, please contact Seeed Tech Support Team techsupport@seeed.cc. This Azure Sphere development kit can be only used for prototyping. It cannot be built into a product for commercial distribution. It cannot be re-sold or used as part of a production environment. The software included in this product contains copyrighted software that is licensed under the GPL, LGPL or other open source licenses, listed at aka.ms/AzureSphereSDK. You may obtain the source code for applicable software from aka.ms/AzureSphereSDK or by sending an email to order@seeed.cc. Secured from the silicon up. The new MT3620 crossover class of MCUs combines for the first time both real-time and application processors with built-in Microsoft security technology and connectivity. An OS built for security and agility to create a trustworthy platform for new IoT experiences. Our secured OS builds security innovations pioneered in Windows into an HLOS small enough for MCUs. Protect devices with a cloud built for IoT security. The Azure Sphere Security Service renews device security, identifies emerging threats, and brokers trust between device, cloud, and other endpoints. 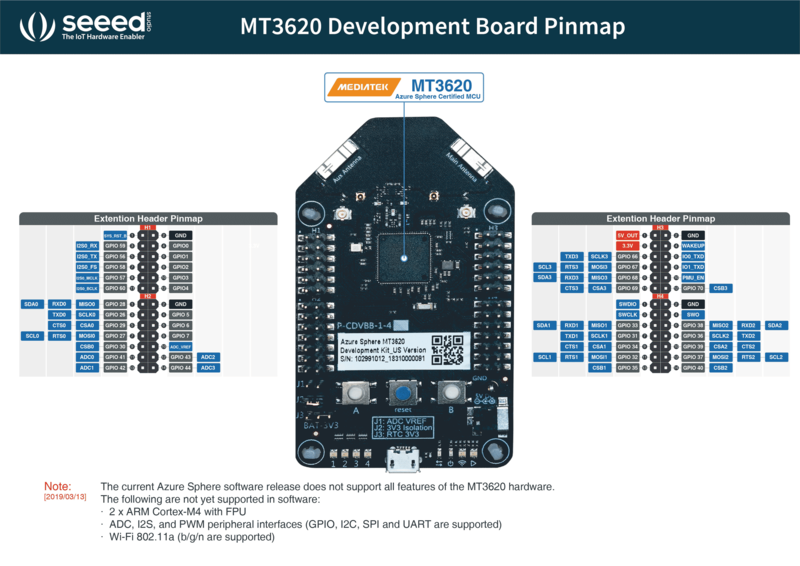 Please note that the current Azure Sphere software release does not support all features of the MT3620 hardware, including the two general purpose ARM Cortex-M4F cores, some peripheral interfaces (ADC, I2S, PWM), Wi-Fi 802.11a. 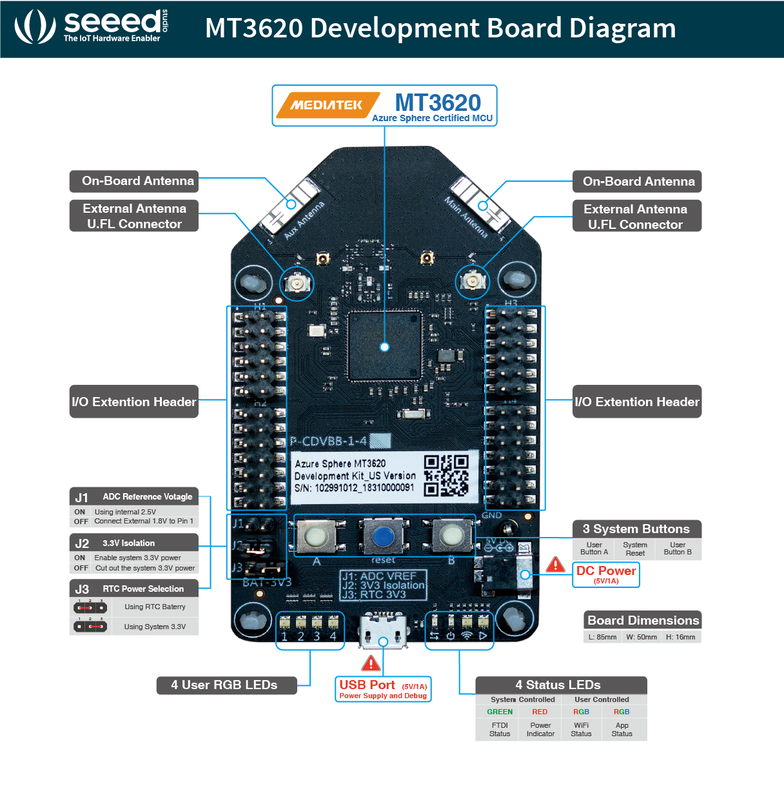 For ADC, customers can use MT3620 Grove Shield board, which has a I2C12-bit ADC chip. Please find the instructions to set up your device here. The pre-order had a zero shipping cost (to the UK), but will there be a shipping cost for the device once it's ready to ship in September? Hong Kong is under "China" restriction? 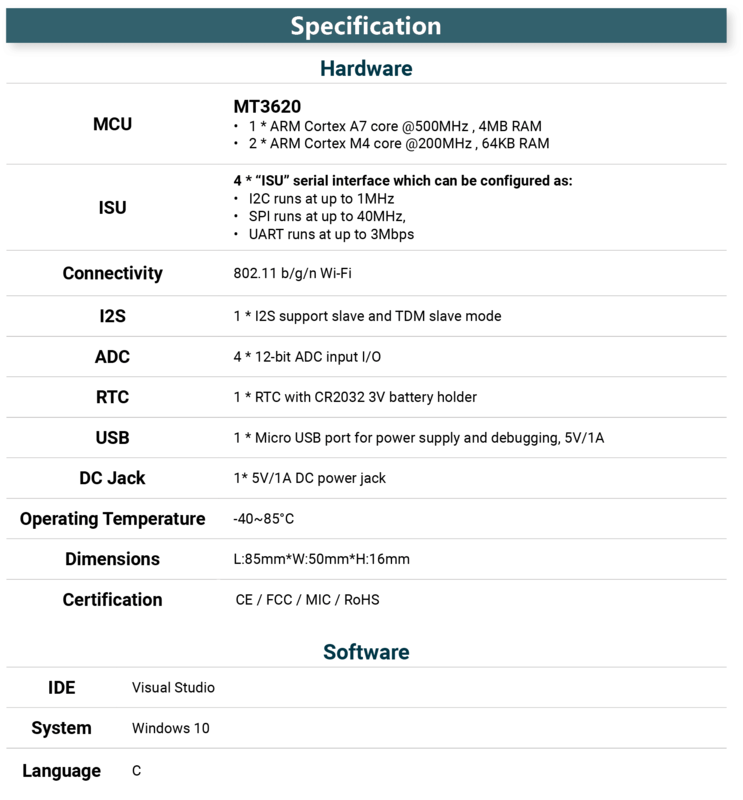 Can you share the datasheet of the dev board? I see multiple UFL connector on the board. What is that for? Are there any additional components like GPS or sensors built-in to it? Hello: When will the SDK be available? Hi there~ We will release the SDK in this page as soon as it is ready. Please stay tuned. Hello. Can i get it in Russia? Hi There, Russia is in Countries or regions available list. thanks. Do any of the GPIO pins support open drain output? Hi there, MT3620 offers GPIO, each with the following options of configuration. Output mode: Actively-drivern push-pull output, or open drain. So you can configure it as open drain. thanks. Hi where can I find detailed measurements / schematics for the board (showing the measurements of the board, standoff locations, external i/o ports (headphone jack, etc)? Thanks! What's the status on CAD models, schematics? The MT3620 Block Diagram shows a few more I/O peripheral than I see on the development board (2 x 26). Which I/O are exposed on the board? What is it's power regulation capability? Can you verify the final product cost? I think you are saying US $84.90 which is just shy of $85 plus shipping. Is that correct? This development board can be only used for prototyping, it cannot be built into a product for commercial distribution. It cannot be re-sold or used as part of a production environment.